Asian cuisine is widely sought after for plenty of reasons. The use of various elements in the layering of flavors, and the cultures behind them, elevate these delicacies to world-class status. And when you have these impeccable dishes offered in one restaurant, diners will organically come rushing in. As is the case for Lazat. Tucked away in Timog Avenue, this restaurant at Scout Limbaga would be hard to miss with its huge area and grand facade. 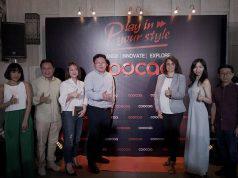 Meanwhile, entry in to its generous indoor space will instantly make patrons feel at home with abundance of greens, posh design, and cozy furniture. Its tropical interior layout was a masterpiece of part-owner and celebrated interior designer Ivy Almario. A two-level structure, Lazat has a wide dining area downstairs and second floor that can be rented out for functions. 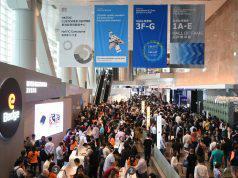 There’s also a tinier room in the same level which is for much more smaller groups. At night, the veranda lights up to serve as a chill spot for enjoying drinks. We got to sit down with one of Lazat’s owners who shared with us that his involvement in the business was quite unexpected. 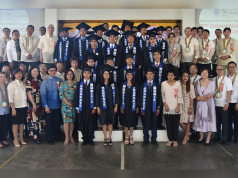 Working as a waiter while modeling in print and TV on the side, Alvin Fortuna was fortunate to meet Yong Nieva, husband of Ivy Almario and fellow Lazat partner, through a mutual friend. 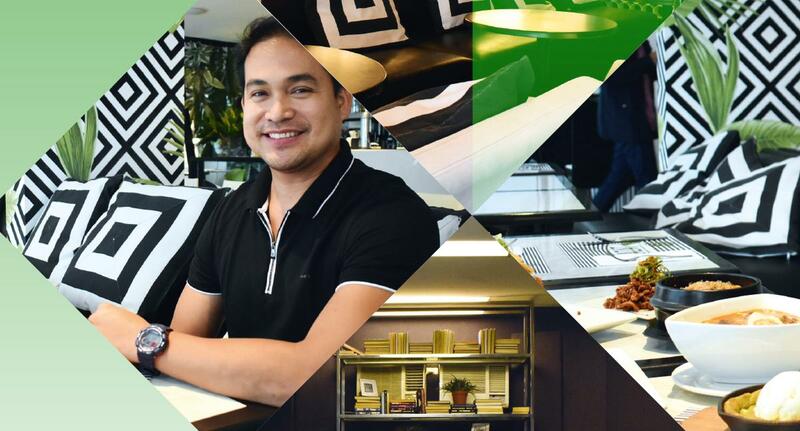 Alvin, who was then already acting in local TV shows, was offered to handle Yong’s other booming restaurant’s PR—Romulo Cafe—and soon enough was propositioned to be partner in a new business venture, which is now known as Lazat. Not a stranger to the food industry, Alvin showed his passion for food as he guided us through ins and outs of the restaurant. Malay for delicious, Lazat replaced the restaurant’s original name Cerchio. The reason behind this rebranding, as Alvin explained, was because the latter was harder to pronounce while Lazat rolls off the tongue better. 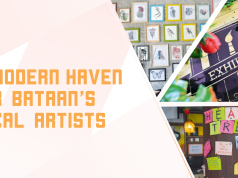 Serving Fil-Asian delicacies, the name would make much more sense once you get to taste their dishes. Chef A1 talked us through some of Lazat’s specialties starting with the Aligue Udon, a Filipino take on Japan’s stir-fry udon noodles. The hero of this Lazat specialty is aligue or crab fat. 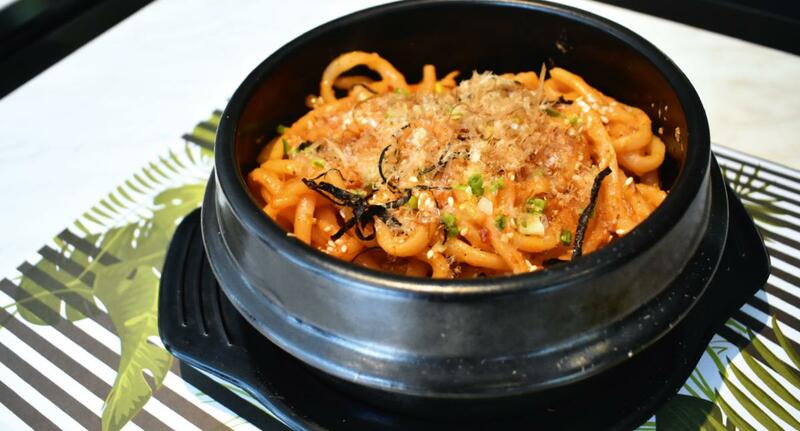 Beyond the unique, flavorful, savoriness it adds to the dish, aligue also gives the udon a tinge of orange which is softened by cream that serves as sauce. Rounding out the dish are bonito flakes and black nori shreds. Among their specialties is Crispy Tilapia. The household favorite is filleted, cut into pieces, and deep fried to a crisp. Adding zing to this already tasty dish is a selection of sauces that go perfectly with the tilapia, namely sriracha mayo, garlic aioli, and Thai chili sauce. 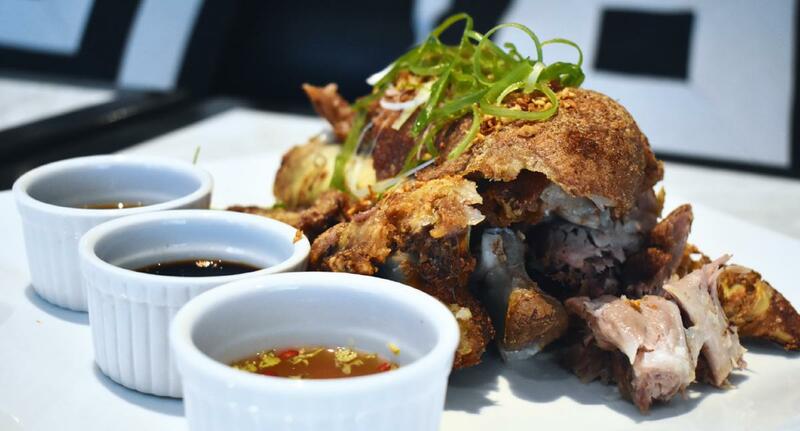 For meat lovers, Lazat has the Oven Baked Crispy Pata. Instead of deep-frying the pork, it is oven-baked which is generally much healthier. The tender meat is also cut into bite-size pieces, and as complemented by various sauces such as chili oyster sauce, Lazat ‘s special crispy pata sauce, and Thai sauce. The Singaporean Squid Head, on the other hand, is a dish that guarantees a clean plate. Squid tentacles are double fried to give them an extra crunch. These are then doused with Singaporean garlic sauce, creating an impeccable combination of texture and spicy-sweet savory flavor. 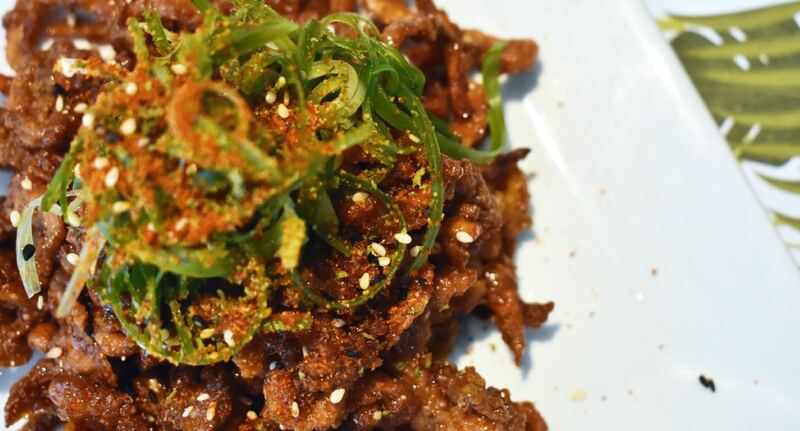 If there’s one thing diners should know about Lazat, it is that they like experimenting and fusing different Asian cuisines together to bring forth dishes worthy of admiration. One at that is their Bulalo Ramen. 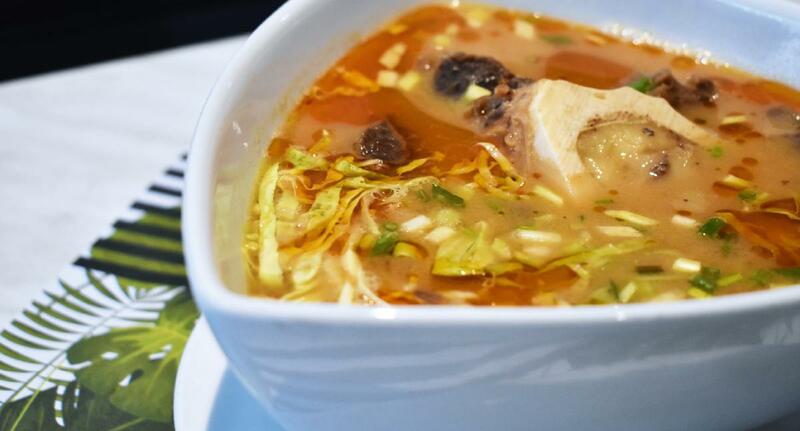 As you can guess by its name, this special takes elements of local favorite Bulalo as well as key ingredients of ramen to create a surprisingly good dish. 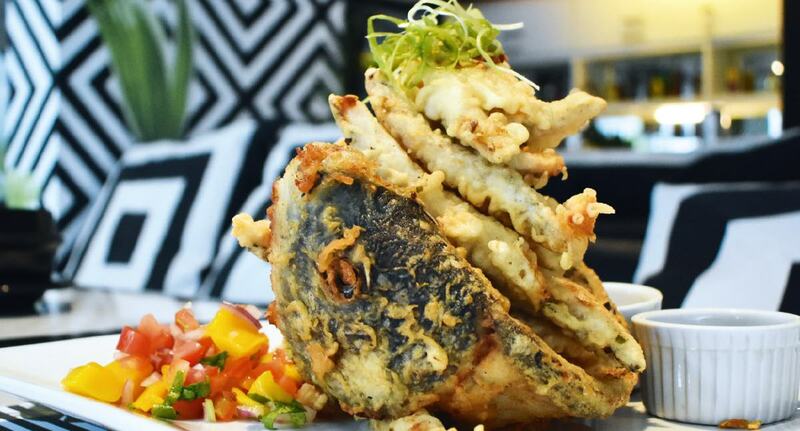 This item in the menu has recently been creating buzz across social media and there’s no questioning why. It is rich, tasty, and has all these familiar elements we look for in comfort food . For dessert, Lazat’s pride is its Matcha cookie. 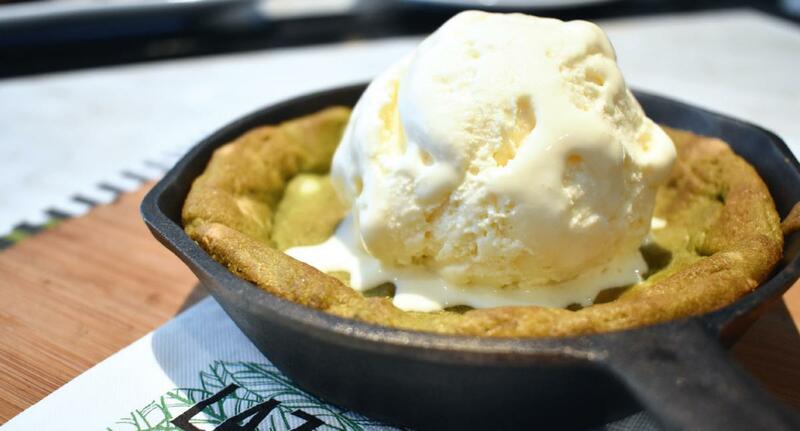 It is a matcha cookie served warm and topped with vanilla ice cream—it’s the perfect reward treat. Lazat also has international favorites such as Pad Thai, Beef Rendang, and local favorites such as Kare-kare in their menu. The meals are good for a group and are priced just right. 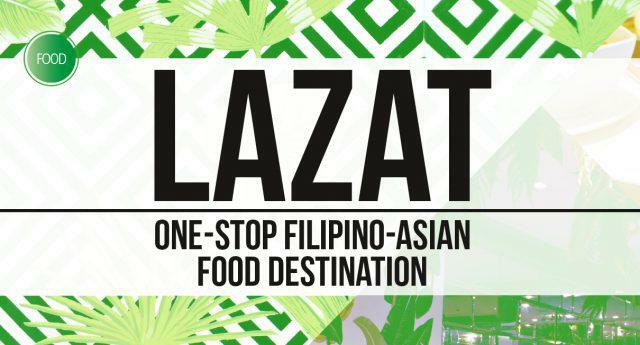 If you’re people who can’t decide where to eat, Lazat is the place to be for satisfying everyone’s local and Asian cuisine cravings. Lazat Fil-Asian Bar and Restaurant is located at 76 Scout Limbaga, Tomas Morato, Quezon City.